Pope Francis on Tuesday greeted members of the Pontifical Academies as they held their 22nd Public Session on the theme: “In Interiore homine”. It is an annual in Rome’s Palazzo della Cancelleria. Cardinal Secretary of State Pietro Parolin read a message sent by Pope Francis . With joy and gratitude, I address you on the occasion of the 22 n Solemn Public Session of the Pontifical Academies, which has taken place annually since 1995, and which constitutes a point of reference for the journey of the seven Pontifical Academies gathered in the Coordination Council, which you chair. This event is connected to the presentation of the Pontifical Academies Prize, organized in turn by each one of them, according to the sector of competence, to promote and support the efforts of those, particularly young people or institutions that work with the young, who are distinguished in their respective sectors for offering significant contributions to the project that we can define as “Christian humanism”. I would, therefore, like to address my cordial greeting to all of you, Cardinals, Bishops, Ambassadors, academics and friends who participate in this Solemn Public Session, with the keen hope that such an occasion may constitute for all, but especially for the prize-winners, an encouragement for research and the examination of themes fundamental to the Christian humanistic vision. This edition has as its protagonist, for the first time, the Pontifical Academia Latinitatis, integrated in the Coordination Council among the Pontifical Academies following its institution, at the behest of my venerable Predecessor Benedict XVI with the Motu proprio Latina Lingua of 10 November 2012, in order to “support the commitment to a greater knowledge and more competent use of Latin, both in the ecclesial context and in the broader world of culture” (4). Therefore, I address a particular greeting to the President of the Academy, Professor Ivano Dionigi, and to all the Academicians, thanking them for their hard work, as demonstrated above all by the journal Latinitas, which provides a qualified and competent point of reference for scholars and lovers of the Latin language and culture. 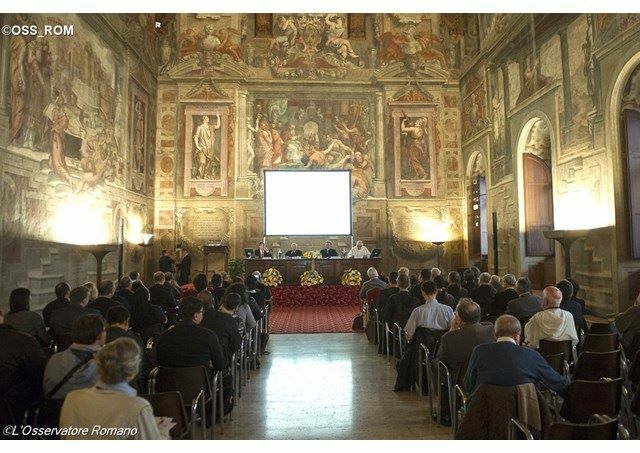 I also congratulate you on your choice of theme for this Public Session: “In interiore homine. Research paths in the Latin tradition”. Indeed, it is intended to combine the research itineraries expressed by Latin, classical and Christian authors, with a theme of absolute centrality not only in Christian experience but also in the simply human. The theme of interiority, of the heart, of consciousness and self-awareness, in fact, is found in every culture as well as in the different religious traditions and, significantly, is presented with great urgency and strength even in our time, often characterized by concern with appearance, superficiality, the division between heart and mind, interiority and exteriority, consciousness and behavior. The moments of crisis, of change, of transformation not only of social relations but above all of the person and of his deeper identity, inevitably demand reflection on the inner and intimate essence of the human being. A page of the Gospel helps us to reflect on this question: it is the parable of the merciful Father. At its center we read the statement referring to the “prodigal son”: “In se autem reversus dixit: […] Surgam et ibo ad patrem meum”, “But when he came to himself, he said … I will arise and go to my father (Lk 15: 17-18). The itinerary of Christian life and of human life itself can be summarized by this dynamism, first interior and then exterior, which initiates the path of conversion, of profound, coherent and non-hypocritical change, and therefore of the authentic integral development of the person. Many figures, belonging both to the classical Greek-Roman and to the Christian world – I think above all of the Fathers of the Church and of the Latin writers of the first Christian millennium – have reflected on this dynamism, on the interiority of man, proposing numerous texts that today are still of great depth and topicality, and deserve not to fall into oblivion. Among them all, a role of absolute pre-eminence certainly belongs to Saint Augustine who, starting from his personal experience, expressed in the Confessions, offers us unforgettable and evocative pages. In De vera religione, for example, he wonders what true harmony consists of, summarizing both ancient wisdom – from the maxim “Know thyself”, engraved on the temple of Apollo at Delphi, to similar affirmations by Seneca – both the words of the Gospel, thus affirms: “Noli foras ire, in teipsum redi; in interior homine habitat veritas; et si tuam naturam mutabilem inveneris, transcende et teipsum”. “Do not go abroad, return in yourself. In the inward man dwells truth. If you find that you are by nature mutable, transcend yourself” (39,72). His reflection then becomes heartfelt appeal in the Commentary on the Gospel of John (18, 10): “Redite ad cor: quid itis a vobis, et peritis ex vobis? Quid itis solitudinis vias?”. “Return to your heart: why go from yourselves, and perish from yourselves? Why go the ways of solitude?”. Then, renewing the invitation, he indicates the destination, the homeland of the human journey: “Redi ad cor; vide ibi quid sentias forte de Deo, quia ibi est imago Dei. In interiore homine habitat Christus, in interiore homine renovaris ad imaginem Dei, in imagine sua cognosce auctorem eius”. “Return to your heart; see there what, it may be, you can perceive of God, for in it is the image of God. In the inner man dwells Christ, in the inner man are you renewed after the image of God, in His own image recognize its Author” (ibid.). These evocative statements are of extraordinary interest also in our times, and are worth repeating to ourselves, to those with whom we share our human journey, and especially to the youngest, who begin the great adventure of life and often remain caught up in the labyrinths of superficiality and banality, of the external success that conceals an inner emptiness, of the hypocrisy that masks the split between appearances and the heart, between the beautiful and cared-for body and the soul, empty and arid. Dear friends, like Saint Augustine, I too would like to address an appeal to you, Academicians, participants in the Public Session, and especially to those who have the task of teaching, of transmitting the wisdom of the fathers, enclosed in the tests of Latin culture; know how to speak to the hearts of the young, know how to treasure the very rich heritage of the Latin tradition to educate them in the path of life, and accompany them along paths rich in hope and confidence, drawing from the experience and wisdom of those who have had the joy and the courage to “return to themselves” to pursue their own identity and human vocation. Now, with the hope of encouraging and supporting those who, in the study of language and Latin culture, are committed to offering a serious and valuable contribution to Christian humanism, I am pleased to award the Pontifical Academies Prize, ex aequo, to Dr. Pierre Chambert-Protat for his doctoral thesis on Florus of Lyon, and Dr. Francesco Lubian, for the critical publication of the Disticha attributed to Saint Ambrose. Furthermore, to encourage the study of the heritage of Latin culture, I am pleased to award the Medal of the Pontificate to Dr. Shari Boodts for the critical edition of the Sermones of Saint Augustine, and to the Latin Teaching Group of the University of Toulouse 2, for the publication of a valuable Latin manual for university students. Finally, to the Academicians and to all the participants in the meeting, I wish an increasingly fruitful effort in their respective fields of research, and I entrust each and every one of you to the Virgin Mary, model of interiority, whom in the Gospel of Luke is proposed to us twice, as she who “conservabat omnia verba haec conferens in corde suo” (Lk 2:19). May she help you always to keep the Word of God in your heart, to make it the luminous and inexhaustible source of all your efforts. I sincerely impart to all of you and your families a special Apostolic Blessing.